I just made some of this today and it smells so wonderful! I felt like I was at a spa, even though I had 4 young children (3 in diapers) running around me all morning. Combine in spray bottle and shake vigorously. Spray in the air to disinfect. 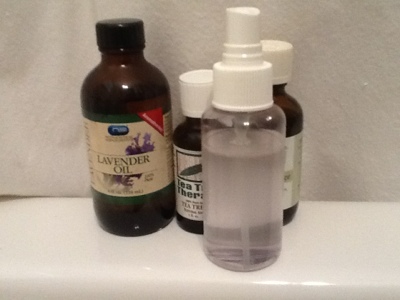 Tea tree oil and lavender oil are anti-bacterial, anti-microbial, anti-fungal, anti-whatever! If you want bonus points, you can up the water (roughly 1/2 – 3/4 cups for every 20 drops of essential oils) and add 20 drops of orange oil, lemon oil and/or eucalyptus oil. 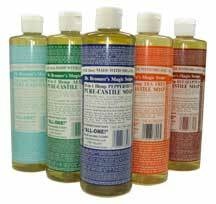 These oils also have antiseptic and disinfectant properties. I added the orange oil to the above and wow! Love it! Making your own allows you to avoid the toxic chemicals found in common disinfectants.